July 12, 2017. “Game of Thrones” characters seem to be enjoying their ale – no serious meal goes without it. But what would it taste like? Homemade beer – and its flavors – is one of the best time travel machines. While cities, traditions and people change throughout centuries, some well-kept local beers preserve the same yeasty, raw flavors for ages. Lithuanian beers, for example, is one of the best kept secrets in homemade brewing world. Homemade beer in Lithuania usually leaves reviewers fascinated and confused, mostly because they feel they have stumbled upon tastes they have never known existed. For example, the Jovaru alus – an amber-colored, hoppy, fruity, sweet and bitter beer – has a yeast strain that hasn’t been identified as a part of any known species yet, making it a totally unique beer DNA sequence. Brewed by Aldone Udriene, the 70-year old queen of Lithuanian home brews, Jovaru beer receives some of the highest ratings in the beer world. The same way as Mrs. Udriene, most small Lithuanian brewers don’t buy yeast from the lab, but pass the yeast on, generation after generation. The yeast is collected after each fermentation, and is used for the next batch, adding to the unusual and unique flavor of the beer. The use of odd ingredients – such as peas, flowers or raspberry stems – combined with brewing methods never used by any other tradition, make Lithuanian beer tasting into one of the most unexpected culinary experiences in Europe. Lithuanian beer brewing traditions come from Pagan times – Lithuanians had several beer gods. 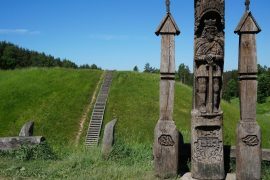 There is even a small ‘altar’ to one of them, Ragutis, in the capital of Lithuania. Ragutis was not only the god of beer, but also of fermentation that helped preserve food and survive long winters. While beer brewing was common in most of the northern Europe, with farmers making their own bread and beer, this tradition eventually died out – but not in Lithuania. Rich in farmland that is perfect for beer ingredients, Lithuania kept its brewing secrets for centuries, with generations passing them down to the next ones. Even though Soviet occupation did not allow any private activity and took over all commercial breweries, local people still kept brewing, often semi-legally. Hundreds of private tiny breweries existed all over the country, using local ingredients and guarding their centuries-old traditions, and operating in isolation from the world. Where can one taste unique Lithuanian beer? 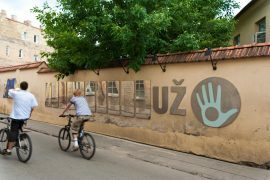 Those who have more time to spend in the country, can take one of the famed beer tours in the countryside, visiting one of the most well-known beer brewing towns, Birzai. 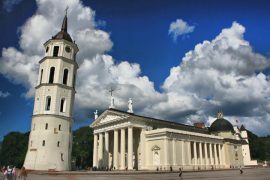 However, it is possible to enjoy different kinds of unique, flavorful Lithuanian beer, and to learn about its history without leaving Vilnius, the capital. One of the unique Vilnius beer tours, organized by Vilnius in Love (a quirky local tour company) has true beer enthusiasts guiding people through some local brewpubs and bars, serving local brews from all over the country. One of the bars of the tour, Snekutis, was one of the first country-style beer pubs in Vilnius. Visitors will get the feel of the old times – combined with tasting of some of the most unique beer flavors in the world. 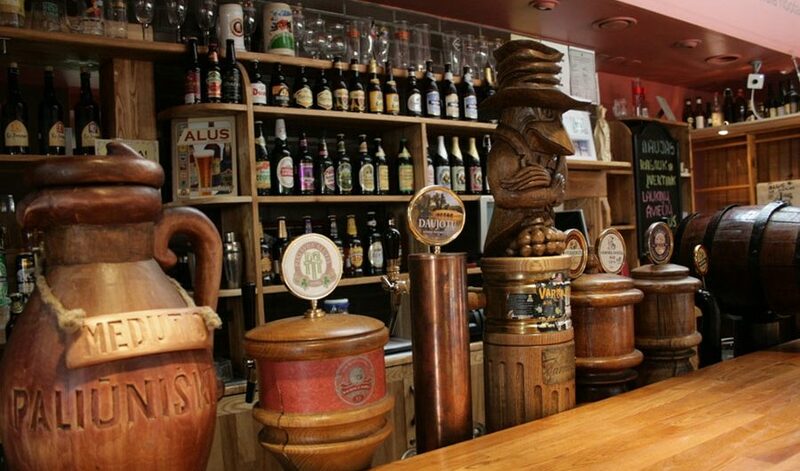 This was also the first beer bar in Vilnius, opened by a true local personality and beer lover. Snekutis also offers “live beer” – not fully fermented type that keeps brewing after one drinks it. To find out more about beer tasting tours in Lithuanian, visit Vilnius in Love.